20121109 - Plenty of Oil Left Near the Deepwater Horizon! We weren't supposed to see any more surface oil lingering around the site of the Deepwater Horizon disaster that occcurred over two years ago in 2010 April, were we? Well, today we did. So did the scientists aboard the research ship Falkor, both underwater with their scientific instruments and on the surface with their small boat and sampling equipment. It was impossible to miss this large slick, located within a mile of the site of the DWH incident. It is quite a bit larger than known natural seeps within 20 miles of this vicinity. We did not see the thick rainbow sheen we saw here last October 05, so we hope that implies some progress in finding and arresting any leakage left from the DWH incident. But this large slick rivals the largest of natural seeps we've seen and documented in the Gulf, and it is outdone in its horror only by the chronic Taylor Energy pollution monster off the southeast tip of Louisiana. If it is not from the wellhead or residual leaking debris, have we a new "natural" seep nearby? Time and research will tell. "The bottom near the wellhead is totally transformed by drill cuttings and debris. It was unlike any deepsea benthos I have ever seen. Cutting breccia extending hundreds of meters away from the wellhead. However, we saw no indication of oil or active seepage. We found numerous pipes and rusted metallic debris. However, neither the swath-mapping results nor our direct observations with the ROV turned up any evidence of ongoing seepage from the blown-out well or nearby sources. We did not explore the coffer dam. Although we are seeing floating oil slicks over the MC252 site, it appears that their source is not associated with the well. The most likely source are what are probably natural seeps to the east, associated with a salt dome. ..."
These scientists will be at sea in this general area for another week, possibly two. Stay tuned for more information as we learn it! We have submitted a FOIA for the detailed physical coordinates of all sites sampled or videotaped in the past couple of months by BP, NOAA, and other authorized entities in this area, but we have not yet received that information. The detailed positions with photos and videos of all our sightings continue to be made publicly available almost immediately. (See the list of articles for Aerial Monitoring of the Gulf on the right side of any page of this website.) It will be interesting to correlate all of the positional information for where we've seen significant amounts of surface oil, and where investigation and repair work has taken place. Lest we feed unwarranted concern, we note that we did not see the heavy rainbow sheen that we noted in this area about a month ago, on October 05, 2012. Also, if the observed surface oil were only about one micron thick, and we assume that the actual area of the surface oil was only about one-third of the area of the slick boundary, the total volume of oil we saw today could be less than about one-half cubic meter, or just over 100 gallons. The Taylor Energy slick seems worse than this by several times. (See calculations in the Flight Log below for waypoint #0411 and for the Taylor Energy slick.) But the concern we probably all share is that this does not appear to be from a previously existing or at least previously documented natural seep, and therefore if this is not still residual oil from leaking hardware after 30+ months, then is it coming from some new cracks caused by the Deepwater Horizon explosion? And will this now be a chronic pollution source, much like the Taylor Energy source has been for so many years? And how much of these kinds of pollution sources can the Gulf tolerate before we seriously compromise the ocean life and our fisheries? These kinds of questions will only be answered with time and research, if indeed they can be answered. Photos and videos are provided below. Here is a video taken of the good-sized slick we found within a mile of the site of the Deepwater Horizon disaster over two years ago. You'll also see the large research ship Falkor (about 83 m long in size) and a small sampling boat from it, with scientists who were sampling the surface oil in some of these streamers. Here is a video taken by our "belly viewer" video camera. The airplane wheel you see in this video is our nosewheel. The short video following this one was taken obliquely from our windows. Following the videos are some stills taken from our belly camera and also from the windows. All waypoint numbers below refer to the GPS tracks shown in today's article at OnWingsOfCare.org. Lat/lons are given in degrees and decimal minutes. Aircraft & Personnel: Dr. Bonny Schumaker with Brayton Matthews of On Wings Of Care, Don Abrams of Ocean Springs, MS.
Seas and weather: Seas 1-2 ft, scattered high clouds, 5-15 kt winds from the northeast-north. Visibility: Air good, sea good, scattered high clouds. Maps of our route showing the following waypoints identified during our flight, plus some relevant waypoints from previous flights, are in today's article (including a link to our GPS track file and a Google Earth file). Gulf flyover by On Wings Of Care to survey recently documented surface oil slicks and known natural seep sites in the vicinity of MC252 (site of the Deepwater Horizon disaster in 2010 April), as well as the chronic Taylor Energy oil leak south of Breton Sound, and other oil leaks near East Bay and the Louisiana southeast coastline. Some of the locations of known natural seeps displayed significant surface oil, some did not. 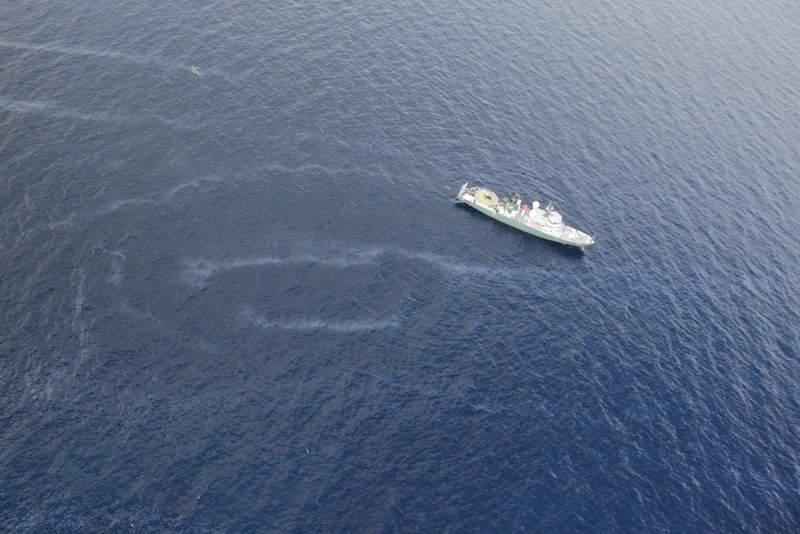 Very significant surface oil was observed over an area centered less than 0.75 nm northeast of the DWH sinking site, which is not associated with a known natural seep. South-southwest end of Taylor Energy leak. We followed it in a 030° magnetic direction (northeastward) for about 8-9 nm, average width 100-400 m. If we use 8 nm for length and 250 m for average width, the approximate area of this slick would be about 4 square km, or about 1 square nautical mile. If the average thickness of the visible oil is 1 micron, that corresponds to an approximate volume of oil of about 1000 gallons. 0417 = ADIZ Xing: N28 55.8 W88 52.3 (KNEW-140° - 90 nm, ~1 hr if we do EBAY and Tay first). *0405. N28 50.771 W88 29.761 Southwest of Whiting Dome. MC166. N28 49.340 W88 17.660 Northwest portion of Mitchell Dome. **0411. N28 46.086 W88 20.654 (Macondo area, centered ~0.75 nm NE of DWH site). Significant slick! This marked approximately the N-NE corner. Primarily N-S ~ 1-1.5 nm, with many parallel streamers running E-W, each 10 m wide and about 500 m long (W-E). 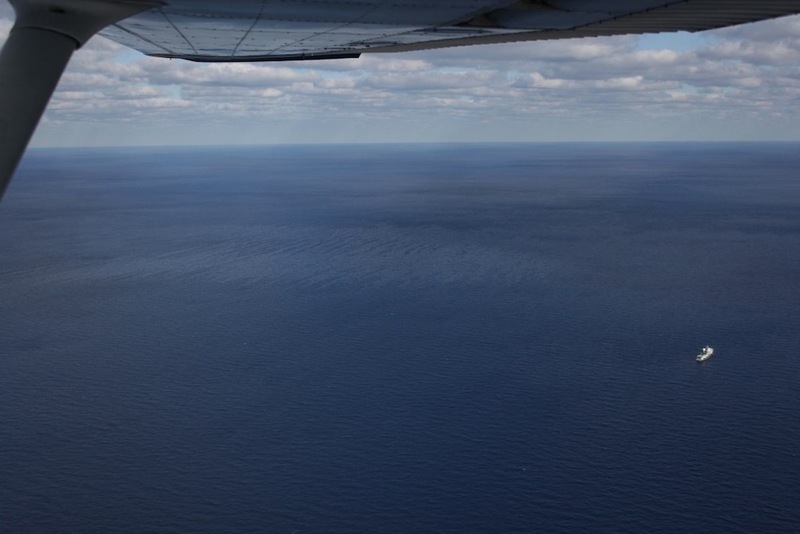 (See our flight tracks, as we flew over and around it several times, while we guided the small sampling boat toward some of the streamers as the large research vessel Falkor stood by.) Note that we observed heavy rainbow sheen in this area a month ago, 20121005 (photos 020-200, 240-260, 220-240). Estimated enclosed area: 1.25 nm x 500 m ~ 1.3 square kilometers. 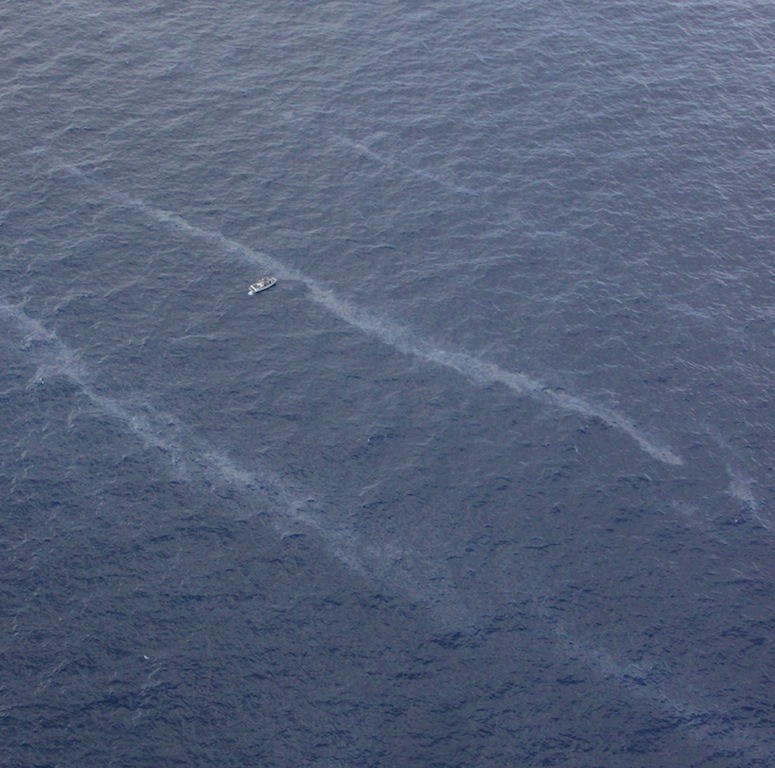 Streamers were spaced about three times their width, so the surface area of the observed oil was approximately one-third of this, or about 0.4 square kilometers. If the surface oil were 1 micron thick, the total volume of oil observed would be about 0.4 cubic meters, or a little over 100 gallons. 0416. N28 45.268 W88 19.999 East of the large slick. No significant oil seen here. 0394. N28 44.297 W88 22.828 West-southwest of today’s large slick. 0414 (& OC26). N28 42.300 W88 22.021 Northwest of Gloria Dome, Northeast of Biloxi Dome, South of MC252. OC26 is site of a known natural seep. No significant surface oil seen here. *0412. N28 42.991 W88 05.209 North side of Mobile Dome. *0413. N28 39.570 W88 11.196 Northwest of Dauphin Dome. & MC294. N28 41.620 W88 29.090 Northwest of Biloxi Dome. 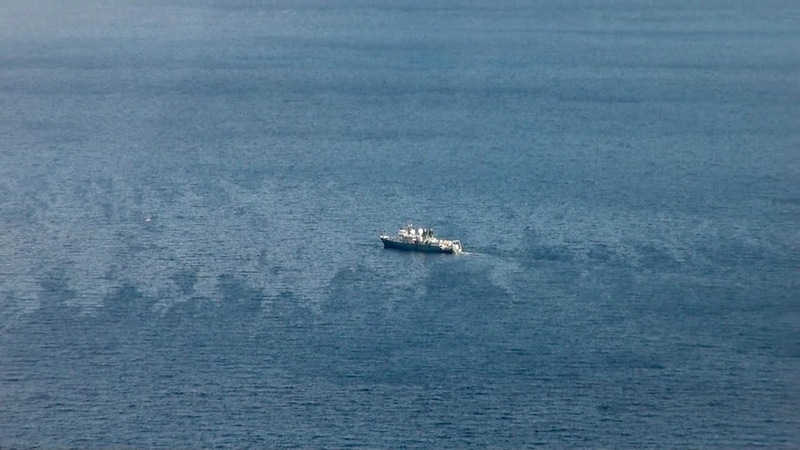 Significant surface oil seen again here (also seen last Oct 05). Site of a known natural seep. Approximately 20 sizable streamers running W-E, the entire block runs more or less SE-NW, about 0.5 nm by 500 m wide. Similar to waht was observed 20121005. *Taylor Energy -- see above. Revisited on the way back, this time from the east end. The west end has the most rainbow sheen in it, and a clear beginning point. Small surface slick about 1 nm east of this point, running SE-NW, about 0.5 nm by 100 m.
Small surface slick, ~ 400 m SW-NE, ~ 100 m SE-NW.